I finished my mom's car trash bag. The pattern is from the book One Yard Wonders. I'd made 2 in the past, one for my car and one for A's. I didn't do the pocket on those, but I did on this one. I used covered wagon fabric that my mom gave a while ago for the bag--her request. I had some scraps of red bandanna print that I thought coordinated well that I used for the binding. This was my December goal for A Lovely Year of Finishes; I was goal setter #63. Please note that I changed my blog name, so that original link won't be there any more, but it has changed over to the new name and can be found here. I had 2 secondary goals for December. One of those I gave up on and am happy I did. The other was to catch up on the Midnight Mystery. I've completed a few months of instructions but am not completely caught up yet, though I'm closer than I was at the beginning of the month! Pre-Munchkin, I watched Fons & Porter For the Love of Quilting on PBS occasionally. At one point, Mary Fons mentioned having a quilting bucket list. I hadn't thought of it that way before, but I had one too. Problem is, it was only in my head. So I thought about patterns or techniques I wanted to try, I wrote down a list, and I posted it in my sewing space where I could see it all the time.This is my original list, written some time in 2014. I've added a few things, but more importantly, several things have been checked off! Two projects were completed before I put them on the list, but I included them because they were "bucket" patterns when I chose them. Those are the Wedding Ring quilt, a wedding gift to my brother and his wife, and the Trip Around the World, which hangs on my living room wall. I Spy--I've done several of these! My first and favorite, though, was actually finished in 2014. It has 192 I Spy fabrics and is now on the the twin bed in Munchkin's room, though he is still in a crib. We have fun naming the stuff when we sit on the bed. Project Linus--I went one better on this one, and attended the meeting of the Charlotte chapter in 2015. I forgot to keep track of how many quilts I donated, but I should get that number from our coordinator soon for tax records, and I will remember to keep track this year. Paper Piecing--I ended up liking this technique more than I thought I would. I ended up with 2 projects--here and here. Ticker Tape Quilt--this technique I did not enjoy, and I will likely not do it again. But I love how the elephant turned out! I'm slowly working through the rest. To me, a bucket list is a long term kind of thing, and not the same as my to-do list or list of current projects. Rather, it's techniques or classic patterns that I want to try or make. I found this link-up about a year and a half too late, but I really like the graphic, so I will end with it. I started the blog solely to have a place for people to sign up for an I Spy swap. I've used "Library Lil" as my online identity for years--it comes from a picture book I like. But I've been feeling down on the name for a while. I'm no longer a children's librarian; my name isn't Lil; the address also had NC it; and mostly it just wasn't what I wanted to be known as anymore. So with a new year coming, I decided it was time to change. 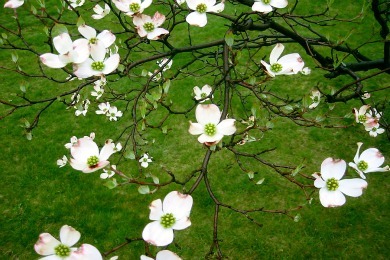 I love dogwoods. Mainly because they are beautiful trees. The dogwood is also the state flower of both the state where I was born (Virginia) and the state where I live (North Carolina). (It's the state tree of Virginia as well, but not North Carolina.) I've done at 3 quilts that feature dogwoods in some way, and there may be more. And so, welcome to The Darling Dogwood! Today is my birthday. My husband and I both took the day off. My plans were to spend some time sewing and to spend some time with my husband. I figured it was okay for it to be shlfish sewing today, so I was going to work on my mini for this month, which I decided would be a Trip Around the World from a kit I was given. Since I'm on a mini kick, I decided now was the time to finally do it. I looked at the instructions last night, trimmed down the included fabric strips, picked an order for the strips, and made sure I had a general idea of what I would start today. Except. My machine didn't like the fabric, and I got lots of puckers. I'm not in love with the combination of colors in the kit. The pieces are smaller than I really like to work with. I wasn't enjoying myself. So after about 1 1/2 really long seams, I decided to quit. The idea of the kit was great, and much appreciated. But I decided that my sewing time is precious and that project was not really what I wanted to do with my time. So I threw out the pieces that I had sewed that were puckered. I put the salvageable fabric in the bag I'm going to give a friend of mine who is starting a maker space at the library/media center in the elementary school where she works. I saved the thread and the batting square, as I can use them for other projects. I recycled the packaging from the kit. I'm not sure what to do with the book, since there are seeral patterns in it but they all use pieces smaller than what I like to work with, so for now it's still around. And I moved on to a quilt top for Project Linus that was about 1/3 finished and is now a completed top, and since my husband was home to help me layer, it is ready to be quilted. I'm pleased with how today went. I have a lot of unfinished projects, and more that I want to start, so working on something that I wasn't really enjoying wasn't a good use of my time. I stopped before I got really frustrated, and I am really pleased with the top I finished today. I actually have 3 goals for December. And barring illness, I should have a lot of sewing time at the end of the month, so I might actually make all three. For my ALYOF goal, I'm picking mom's car trash bag. My mom visited in May, and she really liked the car trash bag I had and asked for one. The pattern came from the book One Yard Wonders. I asked what fabric she wanted, and she immediately replied "covered wagons!" She gave me several yards of this covered wagon fabric when I got into I Spys and swaps--she bought it several years ago and never used it. I've got a fair amount left, so a covered wagon car trash bag it is! Goal #2: Midnight Mystery catch up. I am super behind in the Midnight Mystery Quilt Along hosted by Cheryl of Meadow Mist Designs. I'm loving the design and the process, so I'm hoping to be caught up by the end of the month. Goal #3: December's Mini. I've got the day off on Wednesday and am planning to do some selfish Birthday Sewing, so I'll start on my mini for December. Specific project undecided, but likely the Quilt Kit I got as a Secret Santa present many years ago. Linking up with Fiber of All Sorts and Sew Bittersweet Designs for A Lovely Year of Finishes. My cousin Tim and his awesome wife Nichole are expecting their first child, a baby girl, any day now. 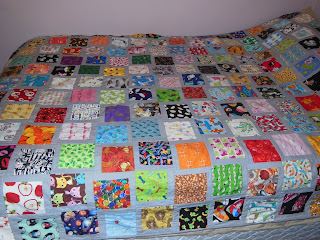 A baby quilt for the new baby was my November goal for A Lovely Year of Finishes (goal setting post #43). I wanted something I Spy, and something I hadn't done before. I settled on the Moda Bake Shop pattern Charming Stars. Someone in a swap group I was in did this pattern and I really liked how hers looked and have planned on using that pattern when I make myself an I Spy quilt, but I'd been wanting to test it out. This has 72 different things to spy. The solid purple is Kona Morning Glory and the sashing is a polka dot that I bought at recent quilt show. I'm really pleased with how it turned out. The back is an animal striped print that my mom bought like 5 yards of for $1 at a yard sale. It's Northcott, so it's high quality, and though I initially thought it too busy for a fairly busy top, I'm pleased with it now. My son (age 2) was outside with me when I was taking pictures, and he loved ducking underneath when the quilt was on the clothesline. I like to think he is looking intently, playing I Spy! One more picture, because I like looking at both quilt and Munchkin! I call it "Singing and Dancing in the Rain" from the last line of the song from the musical. The pattern is by The Tartan Kiwi. I was inspired by this version I stumbled across, but my paper piecing skills are not advanced enough for something obviously directional. I quilted in straight lines and varied the stitch length to try to imitate rain. This is more obvious from the back. My cousin Tim and his awesome wife Nichole are expecting a baby girl at the end of November. Nichole is a quilter, so I thought especially hard about what pattern to use for the baby's quilt. I picked one that I had seen on Flickr from someone who swaps I Spys with me and had been wanting to try. I've got all 9 blocks pieced. I like the design without sashing, but think I am going to add sashing this time around and save this layout for the next time I use this pattern--which will be an I Spy for me! My goal is to finish the quilt by the end of the month. Linking up to A Lovely Year of Finishes. I went to a work conference at the end of October and wanted a business card holder to take with me. I found The Crafty Gemini's tutorial for exactly that, and I had all the materials already. Sold! Fancy it isn't, but it works, and was nice and easy to make. And did I mention I already had everything I needed? It's a good size, fits a lot of cards, and was easy to find in the purse/briefcase hybrid I had with me at the conference. I'll keep it in my purse now that I'm back. I have been LOVING the finish along hosted by Adrianne. It has been really motivating, and I've gotten more aware of the online quilting community. I've decided to structure my goals for Q4 a little differently. I've broken things into 3 categories: general quilts and gifts, kids quilts for Project Linus, and mini quilts for my A Mini A Month personal challenge. I don't have pictures of everything, but I've got pictures of most. This will be a twin-size quilt for my niece. I asked my brother and sister-in-law if I could make the quilt for when V is ready for a big-girl bed. Another tutorial by the Crafty Gemini. I hope to do this one before going to a work conference next week. My cousin and his wife are expecting, and I finaly picked out a pattern! This will be I Spy, of course. I've been doing the mystery quilt hosted by Carole at From My Carolina Home. The big reveal was mid-September, so I'm finally assembled and I just need to finish it! My kid is crazy about trucks, and he just got a small fleet of matchbox-style cars from his Abuela for his birthday. I'm planning on making him some sort of carrier and/or play mat for Christmas. I've seen a variety of patterns, included those recapped here. I have a plan for a batik hexie mini, and I plan to take this to my work conference next week. I figure if people can knit during conference sessions, I should be able to do a little EPP. I want to have some hand projects to work on, and this felt embroidery project that I found in a magazine looks like a scene out of my childhood. I just made a mini of this fantastic Tartan Kiwi pattern for someone else, and I want one of my own! I was given this kit ages ago! I bought this pattern on my honeymoon to Alaska and have been working on it for about a year. It is very slow going, as I started by hand quilting. I'm considering switching to machine stitching. We'll see. I already said I wanted to have some hand projects prepped to work on, and one will be an embroidery project, though it will likely end up in a quilt once it's done. I plan to adapt this pattern from a magazine. I found this great fabric in the craft bin at my (now former) library. I plan to do some machine blanket stitch now that I have a machine that can do that! This was a fabric donated to my local Project Linus chapter, and the other ladies decided that I needed it. I plan to pair it with some circus-themed I Spy squares. My friend Snow recently gave me a big bag of 2 1/2 inch strip scraps, and I sorted them into 2 Jelly Roll Race quilts. This is the first one. I am really into strips right now, and I just hosted an I Spy swap for 2 1/2 inch strips. I plan to take all the pink & gray strips and use a pattern from the Fat Quarter Shop's online tutorials. I'm pulling the blue and white strips from the aforementioned strip swap for this Blueberry Hill pattern--the name is a fantastic coincidence! I came across a great sale and bought this mini jelly roll that will be perfect for a pattern I got from a local quilt shop hop over the summer. Did I mention that I'm into strips right now? Another great mini jelly roll deal, and I plan to use an online tutorial I recently found. My friend Snow started a BOM and is now bored with it, so her finished blocks (but unfinished project) has been passed on to me. My mom gave me this wizard fabric, and I bought some batik fabrics with stars to go with it. I have no illusions that I will finish all of this, but I never know what I am going to be in the mood to work on, so I like to cast a wide net of project possibilities. Thanks, Finish Along, for being such great motivation!